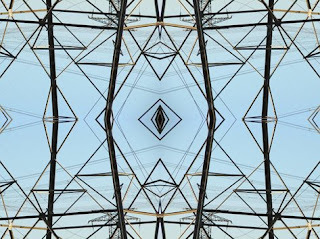 An abstract photomontage work that engages with the electrical power lines which characterizes our urban environment. The combination of still photography, repetition and Solfreggio sound frequencies produce an audiovisual sensory experience which is at once calming and meditative to some, while excruciatingly irritating to others. Apart from selecting existing works, the CITY BREATH project has initiated and developed new collaborations in the areas of the video poem, screen dance and experimental film. Glennie Festival Centre, 3 Jul. 22 October – 1 November 2010, Africa in Motion Festival. 4 May 2010, New South African Cinema, British Film Institute, Southbank, London, (selection curated by Trevor Steele-Taylor). 22 - 25 May 2009, Africa Centre, Cape Town. Africa Day celebrations, 25 May 2009, E Sacks Futeran Building, Cape Town.